What happened to the new Fantasmic Fountains? 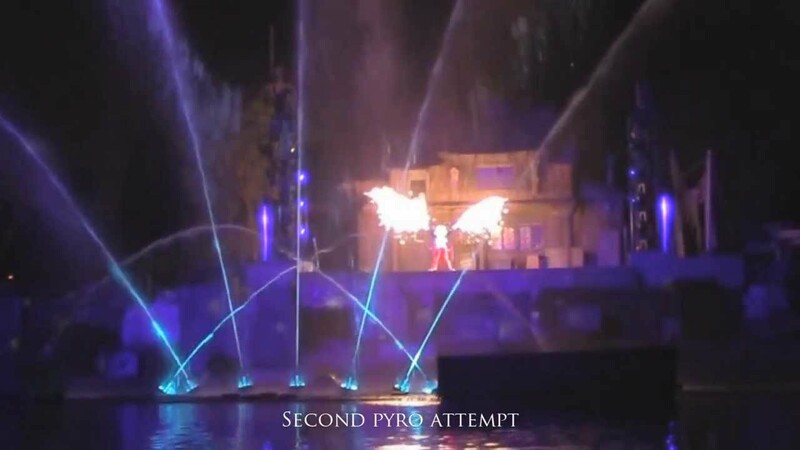 [Question] What happened to the new Fantasmic Fountains? Back in early 2014 Fatnasmic started using new fountains like for the opening but recently they have reverted back to the old fountains with the new ones they used LED tech and they would mover around like the WOC fountains? Does anyone know what happened? From what I've heard, the "dancing" fountains were causing problems with the show synchronization and a lot of stuff went wrong with the show while the fountains were being used. I don't know how true that is, I only saw it once with the dancing fountains and it looked like everything was fine. It makes sense to me though, either that or the fountains broke and Disney didn't want to replace them again. As Ajburk97 stated, one of my visits in 2014 I saw the fountains move and nothing went wrong during the show. But after that they have been stationary. Probably on the next drain they will fix them so they can move and not conflict with the rest of the show. I must admit that it was pretty cool seeing the fountains move for the first time but I'm guessing they'd be more effective in numbers like in WOC. The problem is it seems like WOC is serviced on a regular basis, which I'm not sure is possible for Fantasmic! They were failing more often than was desirable. I think they were belt driven for the movements and those would come off and need constant repair. Easier to just mount the fountains in one place. If they are the "Oarsman" nozzles that World of Color has, they should be hydraulic driven, not belt. Would be weird if they tried something else that they were unsure off. The nozzles at World of Color are the same ones at the Bellagio (coincidentally designed by W.E.T., which was founded by former Disney Imagineers) which have an "XY" pivot aim and have the light rings around them (incandescent at Bellagio, LED at WOC). WET had nothing to do with World of Color or Fantasmic. You can slightly tell that the moving fountains between the two shows are pretty different and not hydraulic (at least the ones at world). I thinkI saw a video where they showed off the world of color fountain at the celebrate premier. From what I understand, there were a few issues with the fountains. The choreography was unreliable and a lot of times wouldn't sync properly with the show, and would often fall behind the other effects. There were issues as well like the video shown above, where the effect wouldn't trigger right away. Also, when the fountains premiered, there was a lot of feedback that they looked "weak" and "small" compared to the previous fountains. The stream is more narrow with these ones, to allow for more precise color effects and wider range of movement. You don't really notice the small streams in WoC because there's so many nozzles. However in Fantasmic!, where there are just 7 nozzles all perfectly arranged in a row, you notice it a bit more. More water is being pushed through the nozzles now to make the stream look more impressive, but at the expense of additional movement. Yikes! That was difficult to watch. I'm no expert, but something tells me that we probably won't be seeing very many improvements to this show, since it's about to go dark for more than a year. It going dark for over a year is the perfect time to improve the show, I believe Disney has confirmed that the show will be plussed during it's temporary closure. i know, I'm just saying they are the ones that designed the "Oarsman Nozzles" initially, WDI just improved on the design for World of Color. It certainly drains the magic. I always wondered if the fireworks were coming from Mickey's fingers or something mounted on the stage and that seems to have answered it, though. Very cringe-inducing and I feel sorry for the guests. The video does give me more appreciation for the performers though, they did their best to work around the malfunctions. I know. I meant between now and when the closure begins they probably won't do anything to it. Once the closure starts then, yes, they should take advantage of the downtime to do some upgrades. If they just fix add more fountains that probably be a huge plus, that's one thing that I like about Disney World's Fantastic is all the fountains. AGAIN,...something like that is probably not going to happen at this time. Adding/programming new fountains could cost more that we think. And let's say they get them installed by, say, November 11th. They will be operating for 8 (eight) weeks until January 11th, 2016, after which they will sit, unused, for possibly more than a year, probably getting rusty. Again, you probably won't see much done to the show now as it would make no sense. Delayed gratification, people. It's going to be a fact of life for the park for the next year and a half at least. I think he meant that he wants them to add fountains during the closure, I don't think anyone expects them to enhance the show in the next 2 months. Just to clear things up, WET had nothing to do with any fountain project at Disney since Fountain of Nations at Epcot. The moving fountains at World of Color are in no way similar to the Oarsmen developed by WET, And WET nor any other company out there has a hydrolically powered moving fountain. The oarsmen and the fountains at WOC use electric motors. The Fan! Fountains were a new design of the ones at WOC, made by the same company (not WET) however they were a smaller design, and belt driven. Had frequent problems. They are pulled for now.